Why don't you people get your act together? I think it's because we have a lot of morons. They root for the Eagles. They root for the Phillies. You really expect them to comprehend the impact of plastics? Please!!!!! You forgot to mention the flyers. Flyers fans are eagles and phillies fans on steroids. You guys are going to upset Grower. Mrs psu_dad: You started this. Me: Well excuse me for trying to save the planet. I hope he's nicer to his neighbors. Having a polymer science degree and having worked in the consumer packaging and medical device industries I can unequivocally tell you that you guys are missing the mark of the use of plastics and impact on the environment. There's a big difference in the efficacy of materials slected for an application and human behavior and whether they responsibly use a product. 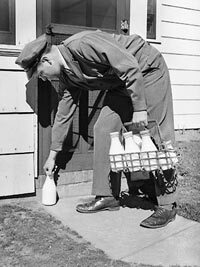 So you're basically responsible for the death of the milkman. And now B&W is polluting landfills with those 50-gallon plastic drums of milk he buys from Costco. psu_dad wrote: So you're basically responsible for the death of the milkman. And now B&W is polluting landfills with those 50-gallon plastic drums of milk he buys from Costco. Perhaps, but I still blame Morelli. sameoldlama wrote: Having a polymer science degree and having worked in the consumer packaging and medical device industries I can unequivocally tell you that you guys are missing the mark of the use of plastics and impact on the environment. There's a big difference in the efficacy of materials slected for an application and human behavior and whether they responsibly use a product. I'd really like you to elaborate on this. I'm genuniely interested in what we are missing. And, as to your last point about human behavior - while I think it's tough to argue against that point, I don't get how plastics are not inherently a problem. Especially when it comes to things like disposable containers. psu_dad wrote: You guys are going to upset Grower.